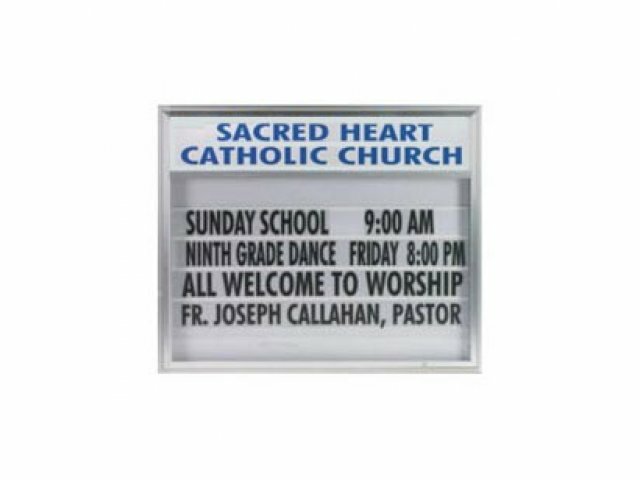 Satin Alum Single Faced Illuminated Directory 70"x50"
Shown with title text on top, not included. 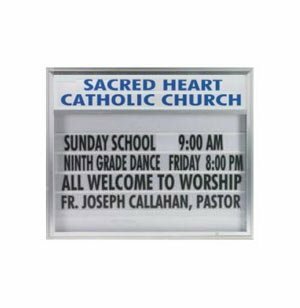 White Panel Illuminated Outdoor Directory units are made of heavy duty aluminum extrusions, satin anodized for long outdoor life. Doors open from the bottom and are attached with non-rust continuous hinges which can lock in open position for easy access to letter panel. Unit locks for your security. Two keys included. Custom-made 11"-high header displays your personal inscription. Vented to eliminate moisture build-up inside. Directories come single or double faced. Optional symbol can be installed to the left of message. 500 assorted high visibility 5" letters come standard with each unit. Optional lawn pedestals available for use as a free standing unit. Pedestals are internally connected to avoid vandalism.